Nan Song of China performs his short program at 2015 Cup of China. When Song won a silver medal at 2010 Junior Worlds, many hopes were placed on the figure skater to be a future star from China. In fact, he indeed delivered good results in his first two senior seasons, especially in the 2011-12 Grand Prix series when he brought home a silver and a bronze medal. “I didn’t have huge achievements in my career, but I feel proud that I was able to prove that Chinese men skaters can do well on an international stage,” he said. However, in recent seasons, the 2013 Winter Universiade winner has been struggling with his recurrent injuries, which gradually led to spondylopathy—a serious disorder of the vertebral column—especially in the lower back. Before the Four Continents, the injury was causing the bronze medalist from 2014 so much pain that he described it as “a day felt like a year.” He went to compete regardless, and finished 12th overall. His teammates, Boyang Jin and Han Yan, finished second and third. After the free skate, the 2016 National Winter Games bronze medalist started to consider what it would mean for him if he continued to compete with injuries. Song requested the media not to report anything at the time as he had not made up his mind. Three days later, he finally decided it was the best for him to end competitive career. The federation agreed to his decision. 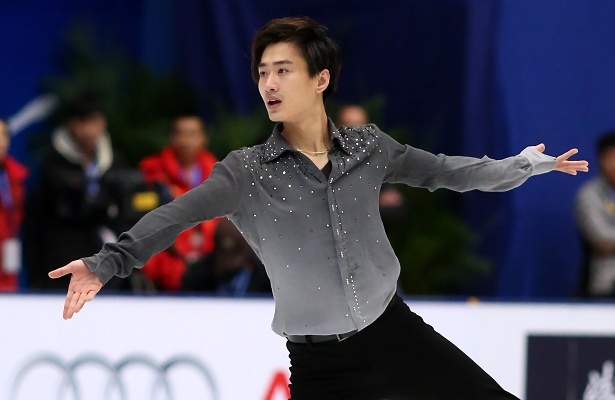 Song stayed silent for another month, because he was listed as the substitute for Team China at 2016 World Figure Skating Championships. On April 4, the day after the Worlds ended, he posted a video on the website of Skating China, officially announcing his retirement.